After several years spent on the banking and in the stands, Andy Bissett started his active involvement in drag racing as a crewman on the Redstone and Gleadow Top Methanol Dragster team. It soon became clear that Andy intended to make drag racing his career, as his degree paper at the end of his time at University concerned fuel flow in dragsters. 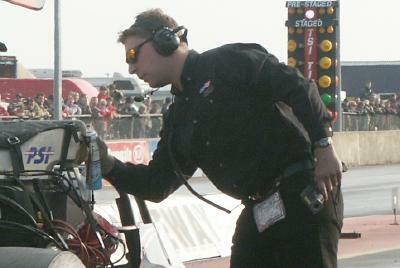 Andy was Crew Chief of the Nemesis then American Car Imports Racing team between 2001 and April 2004, when he left to pursue a career in NHRA drag racing. Andy's career in Top Methanol has taken in such highlights as Fay Fischer becoming the quickest female drag racer in the UK, and for Dave Wilson a large number of event victories, numerous European ET and speed records, the 2003 'double' of FIA European and MSA British Championships, and giving NHRA racers a taste of European Top Methanol racing cuminating in a 5.3-second pass at the 2003 NHRA Finals at Pomona and an NHRA Division 7 event victory in Tucson in April 2004. We interviewed Andy by E-mail April 2004, in the week after he officially left the American Car Imports Racing team. Eurodragster: You've just come off a US Tour which is one of the ultimate dreams for anyone involved in drag racing. How was that for you? Andy Bissett: It has been an incredible trip and the reception from all the racers, fans and media in the US has been far better than we had imagined. We have run in corrected altitudes ranging from 1,000 to 6,000 feet, on track temperatures from 55 to 125 degrees and against some of the biggest names in the class. We’ve had our butts whipped, won some rounds and picked up a Wally which was a dream come true. You just can’t quantify how immensely valuable that sort of experience is and we are all much better racers as a result of it. Plus we’ve travelled over 10,000 miles, seen a lot of this diverse country and eaten in some very tasty truck stop buffets along the way. Eurodragster: How did you get involved in Top Methanol Dragster? Andy Bissett: I started as a very green crew member with the Redstone and Gleadow car driven by Fay Fischer back in 1998 - as the result of a news item on Eurodragster actually! This operation evolved into Team Nemesis along with Dave Wilson’s team in 1999 and when Barry Redstone left and no one else wanted the job I took over as crew chief in 2001. American Car Imports became the principal partner of the team in 2002 and I was very fortunate to be able to play with their toys all over the world for the next two years. Whilst working at British Aerospace I got paid lots of money to do nothing so I took time away from work to spend my savings and race full time from January 2003. Now I am leaving this team to pursue a career on the NHRA drag racing tour in the USA. Eurodragster: Have you got a favourite event from all of those you have contested? Andy Bissett: That has to be the 2003 FIA European Finals. Coming in to the race we needed to qualify number one, set low ET of the meet and win the race to take the points lead and we accomplished all three to win our first FIA Championship. It was a fairytale weekend and it still makes me smile whenever I think about it. Eurodragster: And a least favourite? Andy Bissett: The Main Event in 2000. We had a new wing frame to put together so we skipped the first day’s qualifying to finish the job. The rest of qualifying the next day was rained out and we never made a qualifying pass and only got the ten points for showing up. We shot ourselves in the foot for the FIA title from the very beginning and should have known better. Now we always run in the first qualifying session! Eurodragster: Does any one run, of all those you have overseen, stand out? Eurodragster: Does any run stick out for the wrong reasons? Andy Bissett: The 5.58 we ran in the final at the Alastaro FIA event in 2003. We qualified number one with a 5.51 and a seven hundredths advantage over the rest of the field. On race day we didn’t have a good handle on the track and slid backwards whilst Peter Schöfer’s car got quicker all day. We had no mechanical problems and the conditions were good, we just didn’t do our job well enough and got beaten. Those kinds of losses are hard to take. Eurodragster: We noticed that like all good Crew Chiefs you obviously relish your 'toys', which did you particularly enjoy playing with? Andy Bissett: My favourite toy was the PSI blower, which moved our programme to a whole new level. It was easy to tune, low-maintenance and reliable. At the other end of the spectrum were the yellow-lettered Goodyear tyres. We were quite happy with the old style, white-lettered Goodyears but they stopped making those and the new style were totally different. It gave us fits trying to make them work and eventually, like everyone else, we were forced to ditch them in favour of the better but more shake-prone Hoosiers. Eurodragster: In all your experience in the sport, have you a favourite person or is that a indiscreet question? Andy Bissett: My favourite person in drag racing is Dave 'Happy' Wilson. My least favourite person in drag racing is Dave 'Grumpy' Wilson. Eurodragster: What made you call it a day with the American Car Imports Racing team? Andy Bissett: I have been lucky enough to race full time and it’s been awesome to focus on racing. I want to continue to do so but I also need to make a living now too! There are over a thousand professional drag racers in the USA and just a handful in Europe so the opportunities are far greater in America. I feel that the time is right to move on from my current team, have always dreamt of working on the NHRA tour and will never be at a better stage in my life to try to fulfil that dream. Eurodragster: So what happens now? Andy Bissett: I am currently half way through a trip around the world, having made a three month stop here for our US tour. Now Jenn and I are going to New Zealand, Australia, Japan, Hong Kong and India before returning to England in time to spectate and socialise at the FIA European Finals in September. Then we are getting married in California in November and I will be starting work with an NHRA team shortly after that. Nothing is settled yet but I have made plenty of contacts during our US tour and it looks like I will be crewing on something with nitro in the tank. Eurodragster: How would you sum up your drag racing career so far? Andy Bissett: It’s been a roller coaster of emotions but I wouldn’t trade all the experiences, travelling, win lights and good times I’ve had for anything. Plus, as Clive James would say; “I knew a lot less before. I know a lot more now”. 2003 was an incredible year for us but prior to that there had been some difficult times. The support of the Wilson family, Anthony and Jon Cohen at American Car Imports and particularly my fiancée, Jennifer, and eternal bad influences Phil Pratt and Darren Galloway, always kept me going and I can’t thank them all enough for that. Eurodragster: Is there anyone in particular you would like to thank? Andy Bissett: Every team member or sponsor I’ve ever worked with, all the fans, and all the racers we’ve met in the other lane. Eurodragster: Well said, Andy. Congratulations on your record in Europe, and the very best wishes in your future career and for your marriage to Jennifer. And we bet you a tenner that you'll get dragged in to working at the FIA European Finals!